Beginning April 15, Arrow Factory will present a series of temporary projects by Beijing-based artist Kan Xuan. 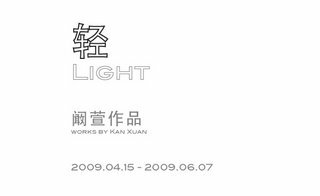 Gathered under the collective title “Light”, Kan Xuan will use the space of Arrow Factory as a testing ground for a variety of ideas and concepts, showing only semi-finished work or works-in-process that are continually modified over a fixed period of time. Over a period of six weeks, Kan Xuan will present four to five different projects, each on view for a period of ten days or less. Instead of exhibiting a finished work at the beginning, the work will only reach completion at the end, representing an inverse model of the conventional static and unchanging exhibition format. Working with artists under these provisional conditions, Arrow Factory hopes to open new modes of exhibition-making by diverting attention away from a finished artwork towards something that evolves within the space and that gives the viewing public a deeper look into the artistic process. 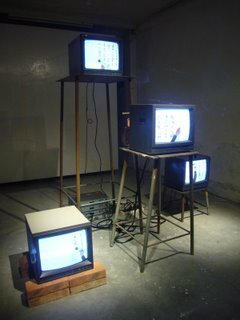 Kan Xuan (b.1972) is a graduate of the China Academy of Art specializing in video and video installation. Her work has been exhibited widely in China and internationally, notably in the Chinese Pavilion of the Venice Biennale (2007), 10th International Istanbul Biennial (2007), NONO at the Long March Space, Beijing (2007) and China Power Station I, II, III in various locations (2006-2008). She completed a residency at the Rijksakademie van Beeldende in Amsterdam and was the winner of the De Prix de Rome Prize in Holland in 2005. She lives between Beijing and the Netherlands. please feel free to stop by if you're in the area.